Video of Nebraska’s Unicameral: Still Progressive after All These Years? 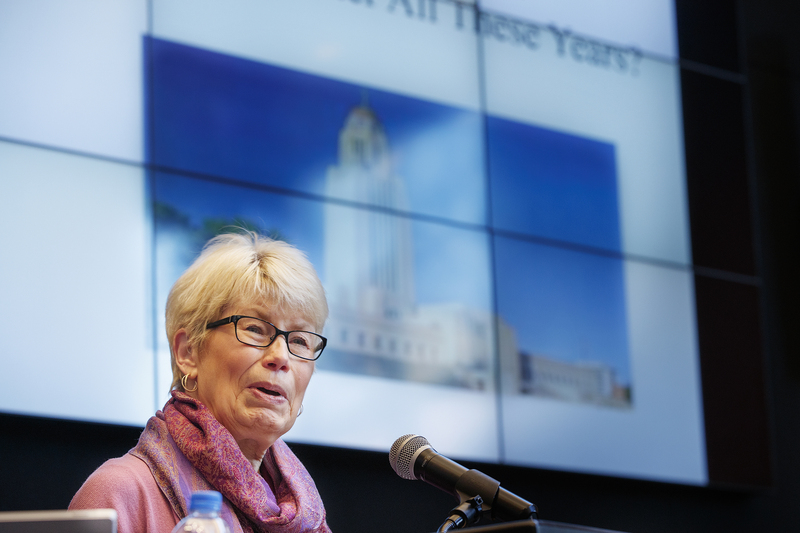 Nebraska’s expanded slate of Nebraska Lectures opened Jan. 23 with Charlyne Berens, professor emeritus and former associate dean of the College of Journalism and Mass Communications, discussing the history of the state’s unicameral legislative body. The talk is now available online as a podcast and video. Regularly offered twice a year and featuring faculty, the Nebraska Lectures: Chancellor’s Distinguished Speaker Series, has expanded in celebration of the university’s 150th anniversary. The 2019 schedule features 12 talks, one each month, exploring the history of Dear Old Nebraska U. Each talk in the series is show live and made available for review online. In her talk, Berens examined how the single-house system has allowed Nebraska to historically avoid partisan gridlock that exists in other legislative bodies. She delved deeper into the history behind its formation and examined whether the system continues to meet the goals of its founders. Berens is author of “One House: The Unicameral’s Progressive Vision for Nebraska,” which examines the creation of the unicameral and chronicles lawmaker struggles to remain true to the legislative body’s non-partisan foundation. Charlyne Berens delivered the first N150 Nebraska Lecture on Jan. 23. The talk is available online in both video and podcast format. The N150 Nebraska Lecture series continues Feb. 12 with a look back at the buildings that first defined the university and how the institution grew from an original four-block plan. The presentation will include an NET-produced virtual reality tour around University Hall, the first building on campus. Kay Logan-Peters, professor of libraries and creator of an online tour of the university’s architectural history, will deliver the free talk, which starts at 4:30 p.m. at the Nebraska Champions Club. The lecture title is “Building Nebraska U: The Saga of University Hall and the Origins of the Modern University.” Logan-Peters is author of “University of Nebraska–Lincoln,” a book that features more than 180 historic images of the university. Copies of the book will be available for free at the lecture.